Yesterday was Halloween. Parties also raged all weekend, and even adults dressed up in funny costumes. Some of them ate candy and other drank booze. And in Germany, one 42-year-old man dressed as Yoda got arrested—probably because the Force was not with him. And also because he got in a traffic accident—a hit and run involving a pedestrian. After the minor collision, which thankfully did not seriously injure the pedestrian, the 42-year-old Yoda-costume-wearing man took off. He was nabbed by German police within minutes. "The officers were especially surprised to see...Grand Master Yoda at the wheel," said the statement from police (via Agence France-Presse) in the city of Darmstadt, near Frankfurt in western Germany. The police brought Yoda to the station and took his license as well as a blood sample. 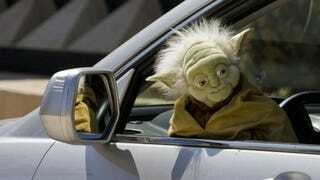 Without a license, Yoda had to hoof it home on foot. Walk, you must.